Students in my group learn modern computer modelling techniques used throughout academia and the pharmaceutical industry. Our group bridges diverse fields such as drug binding, membrane permeation, QM/MM simulations, ab initio molecular dynamics, and quantum chemical modelling. I place a high priority on publishing my student's work. Students in my group typically publish several papers during their degree. I do not employ postdoctoral fellow and typically do not supervise more than 5 students at a time. This allows me to interact with my students on a daily basis and publish research quickly. Mentoring my undergraduate and graduate students is my highest priority. 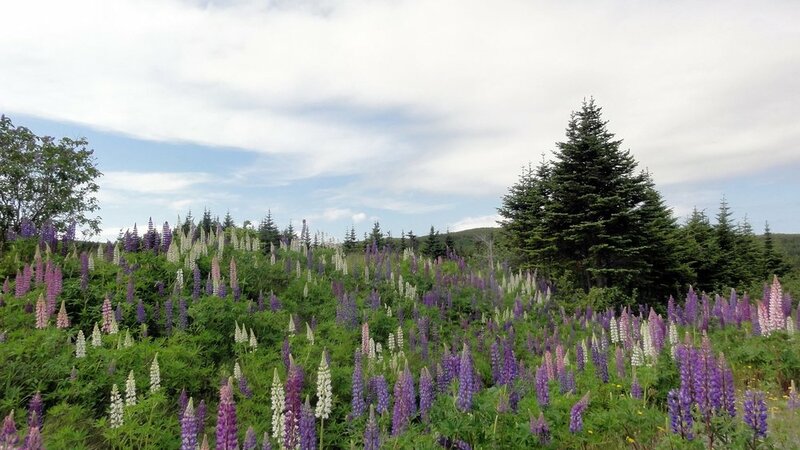 A lupin patch near Bauline. The Memorial University of Newfoundland is located in St. John's, the provincial capital of Newfoundland and Labrador, Canada (google maps). St. John's is among the oldest cities in North America and is a major cultural and economic centre in the region. Newfoundland is known for its extraordinary natural beauty and a welcoming, hospitable culture. Newfoundland has emerged as a major player in international trade and there are frequent flights between St. John's and cities in Canada, the United States, and Europe. Thanks to a strong economy in Newfoundland, Memorial University has been investing heavily in research, with new funding for basic and applied science. Undergraduate and graduate research at Memorial is highly competitive with other research universities in Canada. St. John's is the headquarters of ACEnet, a powerful high-performance computing centre serving Atlantic Canada. The Department of Chemistry at Memorial is comprised of 22 faculty members representing every major discipline of chemistry. More than 80 graduate students are currently pursuing degrees at the M.Sc. or Ph.D. level. Memorial is particularly strong in the field of physical chemistry, with 10 faculty members working in this field. Computation is a strength of the university, which is used extensively in our physics, mathematics, and computer science departments. Due to generous support from the province, our department is in a much stronger financial position than those of many other universities. While many chemistry departments have been forced to cut back, our department has been aggressively hiring new faculty and expanding our research facilities. In particular, the department has invested heavily in the instruction and support of its graduate students. The department places a high emphasis on supporting the needs of the students with competitive stipends, travel opportunities, and teaching experience. Memorial University has a strong tradition of recruiting outstanding graduate students from around the world. Both the university and government have policies intended to attract and retain exceptional applicants. Canada has one of the most ambitious programs for attracting skilled immigrants in the world, with over 250,000 persons immigrating to Canada in 2009. Many graduate students who study in Canada choose to immigrate to Canada after completing their degrees. Graduates of the department have gone on to work in industrial and research positions or continue on in graduate or professional programs at top-ranked programs in Canada and the United States. Please see the International Student Advising Office website and the provincial Office of Immigration and Multiculturalism website for more information. Current tuition fees can be found on the School of Graduate Studies website. I am currently recruiting talented undergraduate and graduate students to work in my group. Students should have a strong background in chemistry, mathematics, biochemistry, computer science, or physics. There will also be opportunities to collaborate with other faculty members at Memorial. Please see my research page for a description of potential research projects. The department of chemistry at Memorial has a large and strong graduate program. Students can pursue M.Sc. or Ph.D. degrees in chemistry or Scientific Computing. Please email me if you are interested in joining my group. More information on applying to Memorial is available on the departmental graduate recruitment website. I am actively recruiting undergraduate students to work on MUCEP, NSERC USRA, and undergraduate thesis projects. Skills in mathematics, computer programming, and physical chemistry will be put to good use, although all students with an enthusiasm for chemistry are welcome in my lab. Please see the departmental website for details on how to apply or contact me directly. I welcome students from other institutions to apply for an exchange term in my group at Memorial. Undergraduates at Canadian universities can apply to hold an NSERC USRA at Memorial. Undergraduate and graduate students from other countries who have funding through exchange scholar programs are also encouraged to contact me.